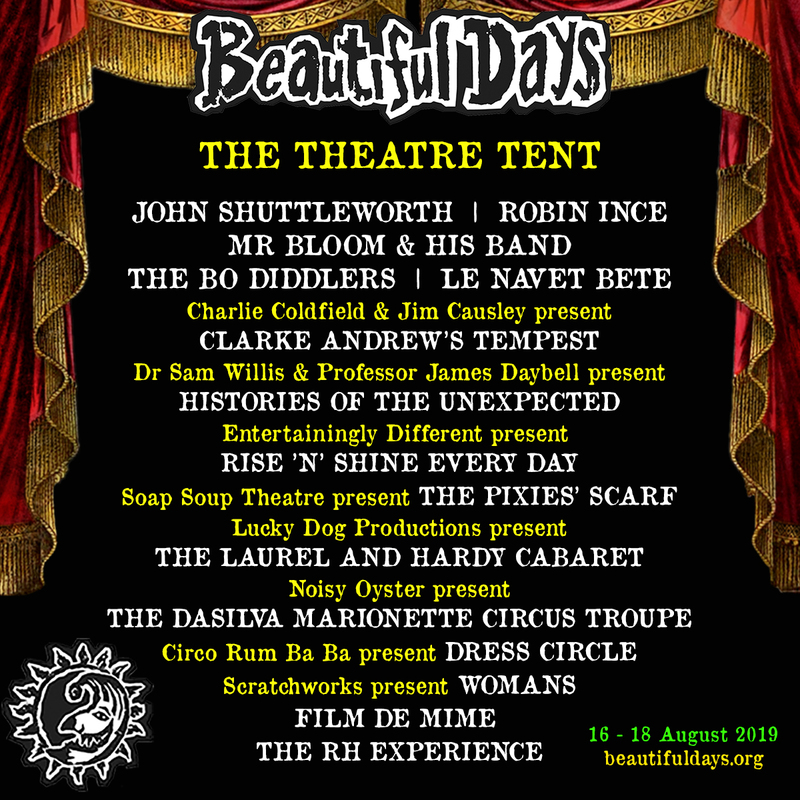 The seated Theatre Tent at the festival has increased in size this year due to overwhelming demand for shows and will this year host stand-up comedy from John Shuttleworth, the enduringly brilliant comic creation of Graham Fellows who is well-loved from his Radio 4 series, The Shuttleworths plus award-winning comedian, writer and broadcaster Robin Ince. Shows will include Mr Bloom & his Band – a four-piece band of musical gardeners, fronted by CBeebies best known gardener, Mr Bloom. Plus Entertainingly Different present their ever popular early morning Rise ’n’ Shine sessions each day. Lucky Dog Productions present The Laurel and Hardy Cabaret – a bumper package of routines, songs and dances from The Boys’ 30-year career featuring some classic movie sequences along with some hilarious Music Hall sketches the pair toured in the 1940s and 50s. Clarke Andrew’s Tempest is an enchanting reinvention of Shakespeare’s play played out through song and physical theatre featuring songs written and performed live by internationally renowned folk singer Jim Causley alongside performance from actor Charlie Coldfield. One of the country’s best-known historians Dr Sam Willis & Professor James Daybell present Histories of the Unexpected – an exciting and fun new show that demonstrates how everything has a history and also that those histories link together in unexpected, and often rather magical, ways. The Theatre Tent also welcomes back favourites The Bo Diddlers and Le Navet Bete plus Circo Rum Ba Ba who present their new show Dress Circle. Noisy Oyster present aerial acrobatics and spectacular cycling stunts with the individually crafted one third life-size marionettes of The DaSilva Marionette Circus Troupe, plus Soap Soup Theatre combine beautiful puppetry, charmingly funny characters and magical music to present The Pixies’ Scarf, Scratchworks take on the Romans and the Patriarchy with their show Womans and the line-up is completed by the highly physical, intensely silly show Film De Mime and improvised comedy sketch group The RH Experience.